Prominent & Leading Wholesale Supplier from New Delhi, we offer garment label screen printing machine and japanese tahio brand multi color screen printing machinery. LT110 adopts computerized control with operation display. The screen printing device is installed with the rexroth cylinder. The servo motor and colour sensor allow repeat printing or reverse side print with perfect registration. It is ideal for security identification ink apply on woven labels. 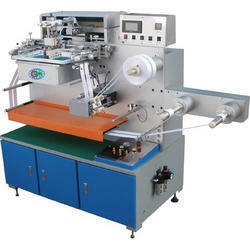 This machine is specially designed for twill tape, cotton tape printing. It is most suitable to print solid colours on dark materials. Fully Automatic One-Eight Color Silk Screen Trademark Printing Machine Series for the thick ink, sharp solid and discrete effects, dark colour on the images, screen printing is the ideal solution. 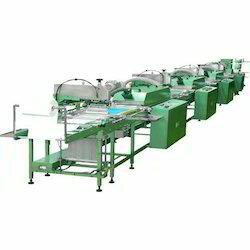 Taiho (Japan) brand machines are very clear in all job steps, with some optional attachments ( Screen Elastic Brand Rewinder, Double side printing Device, Heat Transfer Paper Ink Dryer) - complete and economical printing could be done. All the major components such as air pump, electrical and mechanical parts are imported from Japan and Europe which improve the printing ability and the accuracy of colour registration. Looking for Garment Label Screen Printing Machine ?